5 October 2015. Filed under category Music - General, Music - Heavy Metal. 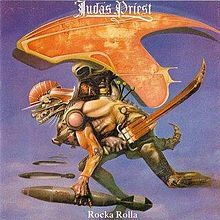 In the last post [forlorn bugle plays in background] we lamented the 13th to 17th greatest Judas Priest albums which, by definition, mean they are the worst on offer. However, I should clarify that even bad Priest is often good music and there are gems among the mediocrity. Most of the lower ranking albums could have been saved, or at least substantially improved, by better production choices so the Priest legacy did not really need to have any low points. It could have been a mighty mountain range that never dipped below twenty thousand feet. The band would have had to work really hard in the Ripper years to meet the twenty thousand foot standard but it could have been done. The bottom five albums were all released in the mid-nineties and later which leaves the entire remainder of the Priest discography dating to 25 years old or more. Draw your own conclusions from that. This is a tough position to fill – the least best of the middle tier Priest albums. 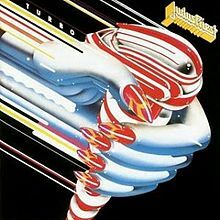 Turbo has historically been considered a great misstep in the band’s career, and it isn’t amazing by any stretch, but I must have listened to it a couple of hundred times over the years. In comparison, everything in the last post of 13th to 17th ranked albums never came close to that level of spins for me. Besides which, Rob will gleefully tell you that in the USA this album sold the best of all the discography. It was a commercial success so it must have had some considerable appeal, even in the face of disappointed old-school fans at the time – who would have bought it anyway. Turbo Lover is still in the live set to this day and it is a good song, mainly because it has a very different vibe to anything else, thereby providing some contrast. Out in the Cold is maybe one of my favourite Judas Priest songs because it served as the perfect opener for my innocent ears on the Priest…Live! VHS and album. The rest is commercial rock music played by a gifted band that should have stuck with metal, particularly given the albums immediately preceding it. Turbo was an experiment into a more ‘radio-friendly’ sound that thankfully they more-or-less abandoned. The guys are just too ugly for that game. We were all thinking it. This was a bit before my time but 1981’s Point of Entry was probably also considered a misstep for Priest, although not on the same scale as Turbo. This album followed the successful British Steel and did not quite manage to get its hooks (or razor blades) so deep into the headbanger of the era or break any new ground. 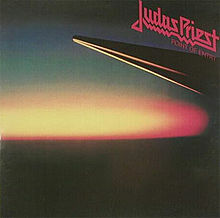 Point of Entry is a stripped back record of relatively simple rock songs but it rates higher for me than Turbo just because, on average, it is more consistent; cheesy, but not too cheesy. I bet if you compared some of the lyrics here to material on Redeemer of Souls it would seem like a masterpiece. Solar Angels and Desert Plains are standout tracks and I always quite liked the closer On the Run too. 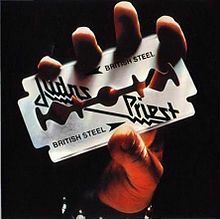 Of course if this had been the only album Priest ever made, history would never remember them as an exceptional rock band, let alone masters of metal, but there is some fun to be had. 1988 is the year I was properly won over by metal and Ram it Down was right up there with the albums I listened to most on heavy rotation. Blood Red Skies is the kind of epic song which can infect the bones of an impressionable 14 year old, as I then was. It changed me, and held up as being extraordinarily heavy compared to its predecessor Turbo. Yet, the years have not been kind to Ram It Down and I have to admit it sounds a bit dated now. The programmed drums do not help, which is something I never really noticed back then. However, there are enough solid tracks to keep me coming back for the nostalgia. The bookends of sides A and B are the strongest tracks, e.g. from the opening scream of the title song, via Hard As Iron/Blood Red Skies to the villainous Monsters of Rock closing the proceedings; which contains one of my favourite guitar leads ever. I even liked the cover of Johnny B. Goode, although I know I am in a minority there. Sue me. For Priest fans Ram It Down was a good follow up to Turbo and restored faith somewhat. 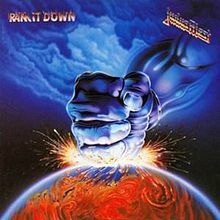 I remember reading a short Smash Hits magazine article that mentioned the previous commercial leanings of the band and rumoured experiments with Stock, Aitken and Waterman but finished with a comment that the new album “had enough metal to build a garage!” I always felt proud I was into the band at what seemed a high point, even if there are many that dismiss Ram It Down as second rate. This might be a controversial choice at number 9 because British Steel was enormously successful and seemed to take the band a long way forward in popularity. However, the reason it did so was down to two of the most overplayed songs ever: Breaking the Law and Living After Midnight. A place at number 9 is still pretty good though! Despite a straightforward rock production, the first studio album with producer Tom Allom in charge, there are some heavy tracks like the opener Rapid Fire and closer Steeler. It is the first album on this list that I can really say is great all the way through. The aforementioned overplayed songs are still good, it’s just I have heard them too many times and they are far too popular with fair weather metalheads. So, any issues I have with the album are my problem really. I still listen to it and enjoy it. The running time is 36 minutes. Take note guys. Better than British Steel? Well, for me, yes. It is probably some kind of weird psychological thing where I feel a band’s first album deserves special credit. 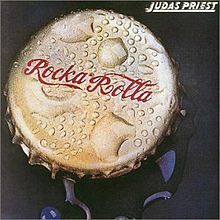 To the wider world Rocka Rolla is usually completely overlooked and seen as a failure but I like the laid back progressive nature of it. For this first effort the record label paired the band with producer Rodger Bain who had garnered acclaim for his involvement with the first few Black Sabbath albums. However, so the story goes, it probably was not a good match as he insisted on selecting tracks he felt were appropriate for a debut, passing over others that were in the live set but were ‘too aggressive’. Or some nonsense like that. Ironically, perhaps Bain was correct in his choice because it certainly eased the world into Judas Priest and left some exceptional material for the follow up album. The main downside to Rocka Rolla from my pedantic perspective is that there are a few different versions with slightly different mixes. The first version I heard (and hence the correct version) was a cassette with a winged cyborg kind of monster on the front. I now have the same cover art in an LP format but it is missing a verse of the title track. The original Coca-Cola logo-rip-off-bottle-cap version has harmonica in the title track and not in Cheater, which was pretty much the main feature of that song. Curse you Gull Records! The reason I like Rocka Rolla is because it is so understated and completely different to anything that followed. It is almost anti-bombastic and grandiose which was what the band spent the rest of its career trying to achieve. Now we are getting into territory where everything that remains is a minor variation of either stone cold amazing or extremely goddamned good. To put things in context let us examine what I do not like about my choice of number 7 first. I never liked You’ve Got Another Thing Comin’ much. This was apparently a breakaway success for Priest and became a rock radio hit, in the days when such a thing was a really big deal in the USA. Yet it has the same problem as the two tracks from British Steel I dislike (relatively speaking), namely such simplistic songs become the best known representatives for Judas Priest but the band is so much better, and heavier, than that. 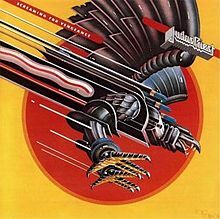 Of course, what I do like about Screaming for Vengeance blows away the above gripes. It is an epic at 38 minutes long. My favourite track was always Fever and it still gets me. It sounds like Halford is singing about a “glee [or gay?] club in the sky” in the best screamy part of that song, but whatever. Everyone knows about Hellion/Electric Eye and the title track so what is the point further analysing them? Awesome. Bloodstone and (Take These) Chains are a little “meh” and that might be why it sits at number 7 and not higher. The more observant will note that we are mostly only left with Judas Priest albums from the seventies. The old adage “I like your old stuff better than your new stuff” holds for Priest but you probably already knew that. The closest Killing Machine comes to a duff track is Rock Forever which in some ways is a template for the less than stellar work they did in the eighties, but even that song is pretty cool in context. And it is only one of a varied track list totalling 35 minutes of joy. Most will know that the album title was too much for our sensitive American cousins so it had to be renamed Hell Bent for Leather in that market (I never understood why the alternative name was less offensive). Also, the original UK version does not include the Fleetwood Mac cover The Green Manalishi (With the Two Pronged Crown) but it didn’t matter to me because I only knew the ten track set and, besides, a live version of that song was part of Unleashed in the East. At the time of release Killing Machine must have been one of the heaviest albums ever recorded (save for earlier Priest titles perhaps) yet it still has a couple of ballads Evening Star and Before the Dawn which I always had a soft spot for. On the heavy side, Evil Fantasies is the song you don’t want your mum to overhear and Hell Bent for Leather is my favourite Priest song in a live setting (it served as the final track on the Priest…Live! VHS and it gives me goose bumps just thinking about it). If any other band penned Killing Machine they would be hailed as metal royalty or at least very high ranking metal officials. 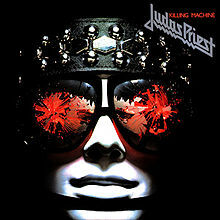 As it happens Judas Priest does not stop at royalty and there was more to come….